Our Foundation Stage includes all our children in our three Reception classes. Bears, Giraffes and Koalas classes! Today our three Reception Classes had a fantastic day out at Whirlow Hall Farm. We had great fun acting out the story of The Little Red Hen and we met lots of different farm animals; we even met the farm's peacock! Today we planted the first of our seed potatoes. Each class will plant some this week and at the end of the year we will dig them up to see who has grown the most. We planted some in a deep pot and some in a bed. I wonder which will grow the best? We need to keep an eye on our potatoes. As they grow we need to add more compost, let's look out for some shoots. The Bears have had a special visitor come in to their class during science week- Professor Sparkles! She showed us lots of fun experiments including a bottle pump ROCKET where we talked about how we could get the rocket to go as high as possible and we made an EXPLODING unicorn horn. We had lots of fun taking part in these science experiments. This week we have done lots of science activities in school and have all enjoyed a visit by Silly Science. We learnt about fire, explosions, rockets and aerodynamics! Have a look at our exciting photos. The Koala class were lucky enough to enjoy a judo taster session today. Gareth taught us about the importance of strength, co-ordination and flexibilty and we learnt how to break fall! We had a very exciting start to this half term when we received strange letters telling us that there were some special eggs that we had to find! We wrote letters asking questions about the egg and we found feathers, scales, and glittery clues around the school. A trail led to some amazing eggs! We are now looking after them in the hope that they might hatch! What could be inside? Today we learned about how the Chinese celebrate New Year. We cooked food, tried using chopsticks, made puppets and paper lanterns and took part in a Chinese dragon dance. Today a beekeeper visited the Koala Class. We learnt all about honeybees. in one hive there is one queen, about 100 boys and 50,000 girls! the queen is the biggest bee and the girls are the smallest. girl bees do all of the work. the honeybee collects pollen on her body and then brushes it into 2 baskets on her legs before flying back to the hive. when a bee has found food, she does a 'waggle dance' to tell the other bees where to find it. bees collect pollen from different flowers and you can see the different colours in the hive. bee keepers wear a special suit when they look after their bees so they don't get stung. Today Giraffes, Koalas and Bears were set a challenge to be more active by Secret Agent Errol Barrows from 'Mission Active' Schools Sports Programme. The hall was set up with a circuit of exciting activities including mini trampolines and mini hurdles and the children all agreed that getting fit was fantastic fun!! Today we went outside to look for minibeasts. We managed to find a worm but we think all the other animals are hibernating as it is so cold! We made worm hotels and houses so any that woke up could be warm and cozy. The Bears had lots of fun in the Wildlife Garden and enjoyed making their own natural paintbrushes and exploring what marks and patterns they could make. We were pleased to see all the children back in school after the holiday. They have settled in well and are enjoying exploring in all the different areas of learning. This term our topic is 'Traditional Tales. If you would like to have a go at the oral story your child is learning please click on the links below. We have been pleased to see all of our children back after the Christmas break. They have settled back in quickly and are enjoying learning about their class story. Today was "Christmas Jumper Day"! The children left their uniform at home and we raised lots of money for "Save the Children", many thanks for all the generous donations. Today we had our Christmas Workshop! Lots of parents/carers came to make a huge array of Christmas crafts across the whole school. There was lots of glue, glitter and fun. Take a look at some of the things we made. For this year's BBC Children In Need day we had to decide how we would like to raise money so our School Council came up with some ideas and every child voted to choose the winning idea. Dressing up in pyjamas had the most votes so today we all rolled out of bed and came to school without having to get changed!! We had a lovely day snuggled in our pjs, having lots of bedtime stories and the occasional nap! We were thrilled to find the school had raised £271, thank you so much to everyone for their donations, well done. This week we have enjoyed learning the story 'Owl Babies' by Martin Waddell. We acted out the story in groups using puppets outside. Our favourite character was Bill, the youngest owl who always says "I want my Mummy!" After hearing that hedgehogs had nowhere to live the children decided to build a hedgehog home in our Wildlife Garden. They covered a box with leaves and placed dog food inside. We will go back to see if the food has been eaten. The Giraffes also made hedgehog homes from big piles of leaves and tested them with toy hedgehogs! The Bears went up to the Wildlife Garden and made clay hedgehogs. We then pretended to be hedgehogs and made a nest for us to sit in! We have been learning about our class animals. In Giraffes class we decided to find out how big a real giraffe was, so we made a life-size picture of one outside using leaves. We could not believe just how tall giraffes are - as tall as three people! Their tongues are as long as a child's arm and their feet are the size of a dinner plate!! This week we have been learning all about Harvest. Children went on a leaf hunt outside, chopped and tasted vegetables and made bread. Unlike the story of 'The Little Red Hen' all the children helped to make the bread, before enjoying eating it! We also had our own'Harvest' digging for potatoes in the sand. 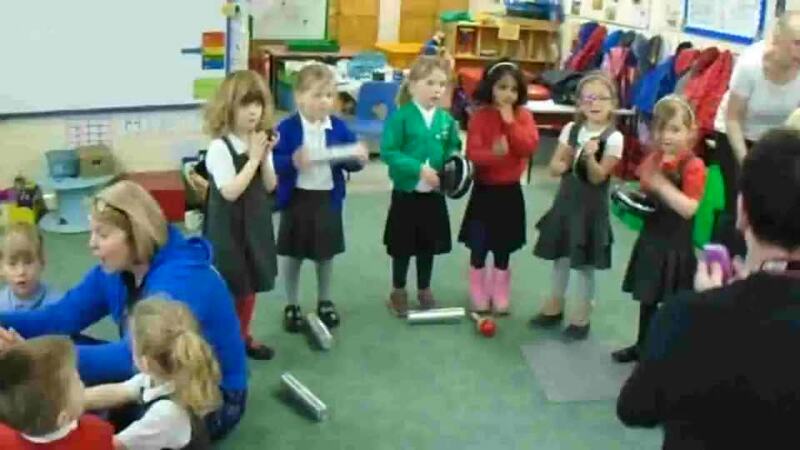 This week in Giraffes Class we have had great fun using musical instruments. We have also enjoyed playing outside ... we love going on our bikes! Take a look at these photos from the Koala Class. We love to make things and play outside! As part of our topic on "Keeping Healthy" we talked about the importance of having a balanced diet. We looked at different foods and why they are good for us. We ended the week by making delicious fruit kebabs using fruit that the children had brought in. We added a few marshmallows for a special treat! Many thanks for all the donations, we had so many different fruits it was hard to choose which to put on our kebabs! Sports Day in Foundation Stage! We had a great time at our Sports Day, with six fun activities including the Hobby Horse Grand National, World Cup Penalty Shoot Out, Feed the Dinosaur and a good old Egg and Spoon Race!! Everyone was presented with a gold medal at the end of a lovely afternoon. The Koalas were also very proud of Zara who showed us some of the dance she had performed at her dance show on Sunday. She was very good and looked fantastic in her costume! We had great fun sorting all the coins that had been brought in to raise money for our new library. We couldn't believe how many there were and we all filled our insect pictures with coins to spare! Many thanks to everyone for their generous donations. Our butterflies have arrived! After 30 days of care our tiny caterpillars have grown and grown, formed a chrysalis and hatched out as beautiful Painted Lady butterflies. We were getting a bit worried in the Koala class when both Bears and Giraffes beat us to it! But finally on Friday whilst we were all out at play, 3 butterflies appeared! Our three Foundation Stage classes had a fantastic day out on our trip to Old Moor Nature Reserve as part of our topic on life cycles and minibeasts. We explored different habitats to find out which creatures lived in them. In the woods we found worms, woodlice, millipedes and many more and we also had great fun pond-dipping; collecting mayfly and damselfly larvae and other water creatures. The lovely weather helped to make it a perfect day! This week all the Foundation Stage classes planned their very own class party! They wrapped Pass the Parcel, completed Tally Charts to decide which food they would like, made buns and chose games to play. Everyone had a great time! What a fantastic start to the summer term we had with a visit from Rock Steady Music School! We experienced an amazing 'rock band' session and then some of us had a go at being in our very own band, playing drums, guitar and keyboard and singing too! We definitely rocked when we all sang "We Will Rock You"! We have a year group full of budding actors, actresses and singers! Everyone performed brilliantly at our Spring Concert this week singing, dancing and remembering all of their lines! Well done to everyone. Take a look below at the children on stage. We had great fun being scientists this week! We had lots of different activities including investigating magnets; looking at how musical instruments make sound and making our own instruments; exploring batteries and bulbs; making a volcano; and melting chocolate then seeing if we could turn it back to solid chocolate by putting it outside. We also enjoyed seeing if chocolate would melt when we put it in our mouths ...yummy!! Help! The Pirates Are Here! All the children in Foundation Stage are having a great time learning through our topic of pirates. The classrooms have a Pirate Shop, School and Fish and Chip shop and the outside sand area has been transformed into a Pirate Cove. All the children enjoyed a fantastic music workshop run by Sheffield Music Hub. Judith and Dan came to teach us a pirate song using drums and shakers. They have left all the instruments in school for us to practise before they come back next week. Take a look at the videos and photos below. Today we really enjoyed taking part in a dance based on the Julia Donaldson story 'The Troll'. The children acted out all the characters in the story; the troll, the mouse, rabbit and the pirates! We scuttled, lolloped and pattered, climbed the rigging, looked through our telescopes and carried the heavy chest of treasure. After learning all the different moves we put the dance together to music and the children produced a brilliant dance. Well done! Today Jenny from the History Van came in and we learned all about what life was like to live a long time ago. We worked in the farmer's cottage doing the washing and ironing, beating the carpets, carrying water and milking the cow. We also talked about travel in the olden days and cleaned the horses tack and looked at horse brasses. Did you know that people wrote with swan feathers and ink? Only feathers from male swans were used because these were the biggest and strongest. A male swan is called a pen and this is where today's pens take their name from. Have a look at our 'Rogues Gallery' below! In Bears class the children have been learning all about the story of the 'Gingerbread Man', and really enjoyed making and eating gingerbread biscuits! They also came up with some great ideas to find a different way to help the Gingerbread Man to escape across the river, away from the fox. This led to some super writing! They also worked independently to make a Gingerbread man from card and split pins, and were really proud of the results. Bears class have also been working hard on addition, and applied their knowledge when playing a game in P.E., where they worked together in pairs to throw a bean bag into a hoop and recorded the scores. Great co-operation and amazing throwing! The Koalas have been learning about the story of 'Goldilocks and The Three Bears'. On Monday the children came to school to find Baby Bear's chair broken and in pieces on the floor. They guessed it was Goldilocks and became detectives looking for clues. School CCTV footage seemed to show a flash of golden hair, could that have been her? The children made hat bands and worked together to make a new chair for Baby Bear. They then branched out in their hat making 'shop' and made hats for themselves becoming 'Feather Man', princesses and super heroes. As part of our topic on traditional tales we have learnt a song called 'The Farmer in the Dell' that was written nearly 200 years ago! 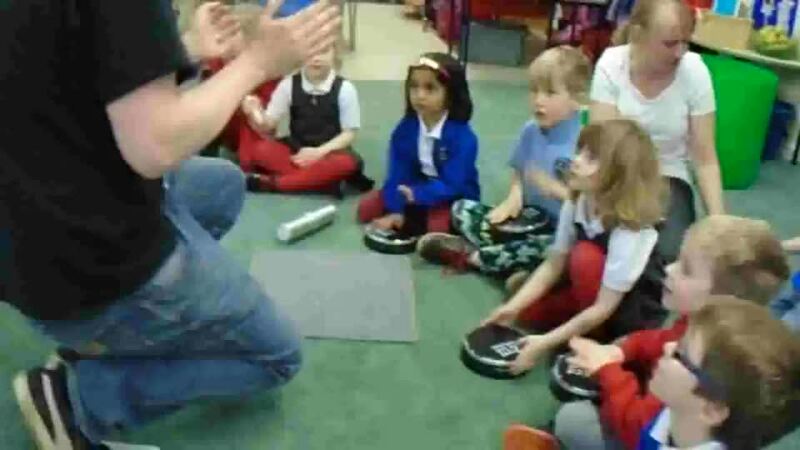 This week we became musicians and added percussion to our song. We practised keeping in time to the beat and for each verse of the song we used a different instrument. We think it sounded brilliant! On Thursday we had snow, lots of it! In Koalas we decided to have a 'Snow Day'. We made snowmen in plastic bottles and left them inside to see how fast they would melt. We put snow in the water tray and added colours using pipettes. We thought the colours might melt the snow, but they didn't. We also used algorithms we had already made in computing to instruct a friend how to make a mini snowman out of real snow! This morning we invited parents and carers to come into school to join in lots of activities linked to our Maths curriculum. Everyone enjoyed a range of activities including: counting, hunting for numbers, forming numbers, estimating how many objects would fit into a shape and counting to check. Talking about 2D shapes, playing games with dice, adding, using Numicon and much, much more! Have a look at our photos to see some of our activities. In Giraffes class we have been reading 'Goldilocks and the Three Bears' and we have had lots of fun activities including, of course, making and eating porridge with different toppings, it was yummy! We had a surprise when we found an intruder had been in our class and broken a chair in our Three Bears Cottage so we became detectives and searched for clues, golden hair was found and we soon realised it was Goldilocks! We then received a message from Goldilocks asking us to make a new chair for Baby Bear so we worked in small groups to design and build new chairs, with lots of mod cons, including a swimming pool, a trap to catch Goldilocks, a slide to go down, a hiding place for Baby Bear and other super ideas! Great team work Giraffes! This Friday an envelope arrived for the children in the Koala class. We were very excited to see a letter and a book from the author Martin Waddell. Before Christmas we did some work around the story 'Can't You Sleep Little Bear' and wrote letters to 'The Bear Cave' to suggest ways in which Baby Bear could get to sleep. Mrs Keeling put them in the post and Martin Waddell wrote back! This was a great way for the children to see that writing has a purpose! This week all the children have enjoyed a trip to Whirlow Hall Farm. We learnt about animals in winter and took part in activities linked to the story Stick Man. The children were so well behaved and engaged in the activities, it was a pleasure to be with them - well done. Below are a few photos showing some of the activities we enjoyed. The children have all been enjoying learning about the story Stick Man by Julia Donaldson. Each class received a letter from Stick Man himself explaining that he had left clues to a Stick Man tree in school! We had great fun following the clues and finding the tree. The Koala class tried to get Stick Man to come out, but although the children shouted his name, there was no sign of him. They decided to leave notes and maps to show him how to reach the Koala classroom. This began a whole series of letters and messages going back and forth from the children to Stick Man. They built him a village and he left another note asking if they would write to tell him more about themselves. I wonder what will happen next? On Friday 1st December the whole school had a Christmas Workshop. We had great fun with glitter and sequins making Christmas decorations for the classrooms! On Thursday we learnt all about how to stay safe crossing the road. We enjoyed a visit from Karen, a road safety expert, a walk to the Puffin crossing on Fulwood Road and played outside crossing a 'road' in the playground. Today we held a Writing Workshop for all parents/carers of children in our Foundation Stage classes. Kristina Scott who is a lead practitioner for the Schools Sports Partnership in Derbyshire explained about the link between gross and fine motor skills and children's ability to write. There were lots of activities for children and their grown-up to try including Dough Disco, ribbon twirling, writing in salt and foam, threading, cutting and writing. Take a look at our photos to see some of the things we did. Please look out in your child's book bag for a leaflet detailing stages of writing development and activities you can try at home. We have been reading "Wow! Said the Owl" by Tim Hopgood, a story about an owl that decides to stay awake all day and discovers a world full of colour. We have had fun exploring colours by showing our owl the colours in our school grounds, making rainbow collages, experimenting with Skittles, as well as lots of other exciting activities. Our new topic of 'Light and Dark' got off to an exciting start with a visit from 'Sam's Safaris'! Sam brought along lots of nocturnal animals for us to meet, stroke and hold! Animals included a barn owl called Spirit, a chinchilla called Scrabbles, two stick insects called Twiggy and Twiglet, a gargoyle gecko called Graham and a tree frog called Terrance! Today we celebrated Diwali! Zara and Arya came in their new Diwali clothes and told us about how they had celebrated at home. They brought sweets for us all to share! During the morning we drew around our hands and decorated them with Medhi patterns, made clay divas and Rangoli patterns. We have been learning about our class animals. Giraffes wanted to see how big a real giraffe was so they went outside and made a life-size picture of one! It was very big! Have a look below at what we have been doing in our first few weeks of school.